The final release of Last Man Standing is inching nearer and nearer, and this weekend we're running the third and final beta! This week we've also got a number of quality of life updates from content poll #45, as well as a balancing change to the dragon spear special attack. 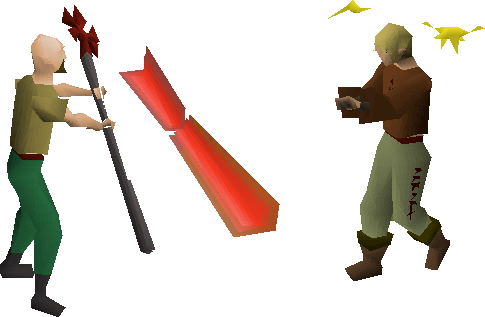 We've made a balancing change to the Dragon spear, Zamorakian spear and Zamorakian hasta in order to address a few problems with the way these weapon handles multiple people special attacking a single target. Previously, if multiple people used these special attacks on a single target the stun effect would stack up and could potentially last for minutes. This caused all kinds of problems with the way damage was dealt, how prayer points were drained and what happens once a player dies. With today's update we have changed the way the special attack functions. You can no longer use the Dragon spear, Zamorakian spear or Zamorakian hasta special attack on a target who is already stunned. In addition to this, players are given a 1 tick period of immunity after a stun wears off in which they cannot be stunned again. This change means that it will be possible to sneak in an action between stuns. Whether you want to drink a prayer potion, eat some food or attempt to teleport or run, you'll have a very small period of time in which you can try. Last week's Last Man Standing beta proved to be a large improvement on the first release. The changes made saw hundreds of players constantly in games over the course of the weekend. To further improve the state of the minigame, we're running a third and final beta this weekend. We've made some substantial changes based on the feedback from the community and we're excited to see how things go this weekend. One of the biggest changes we've made to Last Man Standing is a revamp to the potential loot you can receive from loot chests. We've upgraded a lot of the weapons you can receive, making it more likely that you end up with higher tier equipment. 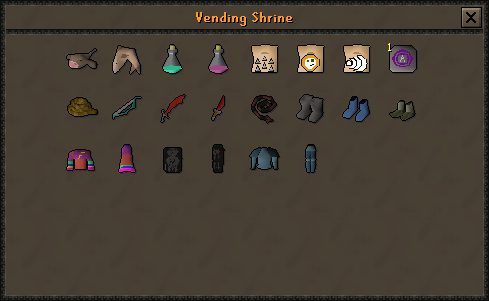 To go along with this change we have also updated the vending shrines to give a larger variety of equipment. We've also lowered the defence level you're given to 70 in order to speed up fights a bit. You'll be seeing fewer 0s throughout games, making your battle for the #1 spot a bit more action-packed. Number of players ready now shown when in the lobby. New looting locations have been added throughout the map. Improved matchmaking system to speed up finding games. Addressed 'unfair' spawnpoints reported by players. Ensured bloody keys are only awarded to a player if they are still in the game. Items now appear immediately when dropped. Increased game timer to 20 minutes. Fog will now deal a maximum of 10 damage. Items are now dropped to the player who dealt the killing blow. Added super energy potions to store. Added ability to regain run energy when consuming bloody keys. Added river crossing obstacle at the southern end of the river. We hope to see many of you jumping into world 317 and giving Last Man Standing a shot over the weekend. We're aiming to release Last Man Standing next Thursday, so now is your last chance to get a bit of practice before money is truly on the line! When you're completing clue scrolls you will now only receive a casket when you are about to get your reward. No more crossing your fingers as you run through the wilderness with your loot! Please note: caskets which you have held onto since before the update will not necessarily be a reward. They may still give you the next step of your clue scroll following the update, or they may open up and give you another casket. World 321 has been reverted to a standard Old School world. Brine sabres can now kill Rockslugs without the use of additional seasoning. You can now complete tasks in achievement diaries without having first started the diary. Higher tier Bones now have a higher Prayer restoration effect within the Catacombs. The Giant Mole now broadcasts the loot from the drop. Metal Dragons within the Brimhaven dungeon now drop noted Metal Bars for players who have completed the Elite Karamja Diary. This can be activated/deactivated by speaking to TzHaar-Mej in the Tzhaar City. Water sources have now been placed within the Gnome Stronghold. Slayer Masters now offer the ability to unlock Red Dragons as a Slayer task at the cost of 50 Slayer Points. A woodcutting guild teleport has been added to the Skills necklace. The drop rate of Elite clues from Skotizo has been buffed. Lava Dragon bones buried in Lava Dragon Isle are correctly affected by the use of the Bonecrusher and the Brutal Spirit bonus. Falo the bard now accepts an uncharged Infernal Axe as well as a charged one. The Hard clue on top of the Agility Pyramid now confirms the version required is the Blue Mystic Top. James now informs players about being able to redeem Bonds for a name change. The barrows STASH unit has been moved to the corner of the central chamber. The Achievement Diary list is now ordered alphabetically. A STASH unit found in the Nightmare Zone has been removed. Players can now complete the Elite Desert task with any kind of feather. Straven will no longer talk about Heroes' Quest before it has been started. Really dissappointed that there's no construction update today. The fabled D Spear Changes at last! strange to put the poll out there with no announcement, especially considering the use of buzzwords like "summoning" and "dungeoneering" that were bound to raise an eye. Please Ronan fix your Forum Avatar! is construction update going to happen in this lifetime or? Any idea on when we can expect the POH update to hit the server? When Ash has finished writing it. Does this mean we can get it before next thursday then? When can we expect Australian OSRS servers?